Cricket Switzerland have been invited by VSL Cricket to submit one or more teams into the first World Schools Cricket Challenge to be in Melbourne, Australia, from 14th to 21st December 2014. Progress towards the first World Schools Cricket Challenge is going extremely well with the first entries received from teams in New Zealand, Canada & Zimbabwe, and strong enquiries from India, Pakistan, England & South Africa. Along with the host teams from Australia the international element is building well and players from various parts of the cricketing world will be able to compete on the fields and mix and mingle off them. Designed by cricket people for the enjoyment of Secondary Schools players aged between 13 and 19, the World Schools Cricket Challenge is deliberately inclusive not exclusive and teams will be graded according to age and ability. Tough cricket of a high standard for 1st XI’s and strong cricket for developing teams under the age of 16. 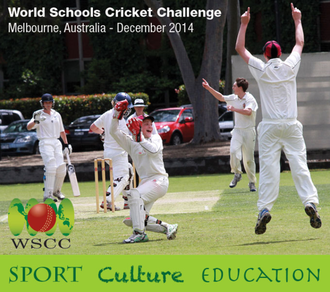 Have a look here to see what the World Schools Cricket Challenge objectives are. Strong support and encouragement from Cricket Victoria and their Chief Executive, past Australian international, Tony Dodemaide. Excellent hosting by Haileybury School, one of the leading schools in Victoria and the principal, Derek Scott, a past 1st Class player with an excellent record playing for Auckland in New Zealand. Endorsement and encouragement from Ricky Ponting, immediate past Australian Cricket Captain and his Foundation. Encouraging signs from schools who like the thought of their teams playing on excellent Victorian pitches against a range of teams in the Australian State that has a major tradition and passion for cricket. The chance to have an exclusive tour of the Melbourne Cricket Ground and Sports Museum. A range of accommodation at the University and in selected hotels. This is your invitation to join the schools already entered and those who have indicated their intent to be part of the first World Schools Challenge to join us in Melbourne, the cricket capital of Australia for a great week or cricket, fun, friendship and fraternity. Take a look below to see what your School will be a part of when you come to the first WSCC or go straight to our website. Programme - When's stuff happening? Sunday 14th December Teams arrive, settle into accommodation and late afternoon transfer to accommodation. Late afternoon transfer to Haileybury School for a Welcome Barbeque and Briefing. Monday 15th December 1st round of fixtures commencing at 10.30am. All matches to be 50 overs per side. Lunch and afternoon tea provided and official umpires standing for all games. Tuesday 16th December 2nd round of fixtures commencing at 10.30am as for the 1st round. Wednesday 17th December Rest day with optional activities including an exclusive tour of Melbourne Cricket Ground and Sports Museum. Thursday 18th December 3rd round of fixtures commencing at 10.30am as for the 1st two rounds. Friday 19th December 4th and final round of fixtures commencing at 10.30am. Saturday 20th December T20 day with each team playing two T20 fixtures with matches commencing at 10.00am with lunch provided between games. Sunday 21st December Day at leisure followed by an evening awards function and dinner. Seven nights on a bed and breakfast basis. Opening BBQ Function at Haileybury School. Finale Dinner and Awards Evening. Coach transfers to and from the functions and the games. Four 50 over games and two T20 games with official umpires and balls supplied. Tournament Souvenir Handbook and Programme. Complimentary Tour of Melbourne Cricket Ground and Museum. Haileybury is pleased to support VSL Events in its attempt to organise a cricket tournament to be hosted in Melbourne in December 2014. I believe it will be an excellent development opportunity for young cricketers from our schools. VSL have a long and successful history of developing sporting tournaments around the world. My association with Peter McDermott and Bruce Warner goes back 25 years and I am sure if you choose to participate you will find them good to work with. Host Venue - Where will you be playing? I am delighted to support the World Schools Cricket Challenge tournament being planned for December 2014 here in Melbourne. Our city prides itself as a sporting hub, and there is no better place to be as a cricket-lover, as the preparations for the famous Boxing Day Test at the MCG reach a climax at that time. People are talking and thinking cricket, inevitably with a smile, and a warm welcome is assured. A cricket tour is one of life’s great experiences, especially for young players. The chance to play in different conditions, against opponents from different countries and cultures, is a truly special time. performances recorded, and friendships made, will be remembered for the rest of your life. I look forward to seeing you here in December 2014! ©2014 VSL Cricket. All Rights Reserved.